The next scheduled meeting will be on Tuesday 14th May 2019 at 7pm at the Village Hall, Bonby. The long-awaited appeal decision has been received for planning application PA/2017/564 - Planning permission for the erection of four agricultural buildings for poultry rearing, together with associated feed bins, infrastructure and new highway access, at Hall Farm, Middlegate Lane, Bonby. The Parish Council still has three Councillor vacancies. If you feel you are able to spare around an hour on the first Monday of the month at 7pm (excluding August and January) please do contact us. Our meetings are under an hour generally, productive and friendly. The Parish Council aim to improve the village but a full quota of Councillors is required to really make an impact. If you would like to try and help make our lovely village the best it can be, please contact the clerk - clerk@bonbyparishcouncil.gov.uk - we would be delighted to welcome new Councillors. We would like to form a Bonby Green Team to improve our village. If you can spare a little time, please contact Sarah Harriman on 618657. The village of Bonby nestles against the foot of the North Lincolnshire Wolds to the east of the Ancholme Valley and has existed for centuries. It is first mentioned in the Domesday Book of 1086 where it was recorded as Bundebi. It is one of the so called Low Villages or Springline villages that stretch alongside the Wolds from Elsham to South Ferriby on the banks of the Humber. These pretty, rural communities are surrounded by mainly arable farmland and enjoy extensive and beautiful views over the Ancholme Valley and the northern most part of the Lincolnshire Wolds. Bonby is situated in the middle of the Low Villages between Worlaby and Saxby All Saints and between the larger market towns of Brigg and Barton on Humber. live for all ages and our community strives to keep it as such. Our small village has a playground and playing field for younger members of the community, the Gilman Trail for walking and picnicking for all ages, a village hall available for all events, ancient and lovely St Andrews Church, a restaurant and a village shop and post office. The surrounding countryside provides beautiful long walks and cycle rides, or simply to sit on the benches at the top of the Wold enjoying stunning views and sunsets. Bonby is a village and civil parish in North Lincolnshire, England, and approximately 4 miles (6 km) south from Barton-upon-Humber. According to the 2001 Census it had a population of 481, increasing to 532 at the 2011 census. The village was recorded in the Domesday Book under the name of "Bundebi". The Grade II listed Anglican parish church is dedicated to St Andrew. The church has an Early English nave and chancel, and a 17th-century brick tower. Bonby held a small priory, established by the Benedictine priory of St Fromund in Normandy. The priory was transferred to the Carthusian order at Beauvale, Nottinghamshire. Population: 532 as at 2011 census. 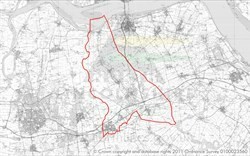 Brigg and Wolds Ward - lies to the east of Scunthorpe and is largely rural. It extends from South Ferriby in the north of North Lincolnshire, down through the Wolds. © Bonby Parish Council. All Rights Reserved. Design by Vision ICT Ltd.